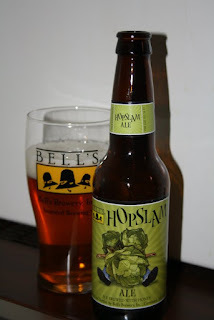 It's been not even a month since Bell's Hop Slam 2011 edition hit the shelves and here we are in the midst of what is said to be the nastiest blizzard to hit the Midwest in 5 to 25 years depending on the source you get such information from. In an effort to stock up on supplies in case of a few days being snow bound I thought I would look around a couple local stores today to see if I could find a six pack still hanging around. Nope, Not even here in Michigan does it seem there are any orphaned sixers or mini-kegs someone hasn't noticed and snagged already. I guess it's a good thing when it first came out a few weeks back I made sure I stockpiled a few extras because, even though previous years it's been great, this year's batch seems to be the best one yet. Lush, rich amber in color with just the right amount of bubbly head that takes it's time to melt away leaving waves upon waves of lace behind. Right at first opening and pour it's aroma is already fills the room. At a distance it's smell of bright citrus and pine. Once it's held a little closer to the nose though apricot, peaches and honey really come to the fore. The taste of the hop profile brings out all the scents above along with a bit of pineapple and mango. Then it's all tied together with hints of honey. There's so many levels here and it all bursts with so much flavor. It's sweet and tarty calling card is then finished out with white pepper bitters and a warming all through the body courtesy of the 10% abv. There has been quite a bit of hype surrounding Hopslam in previous years and this year it seemed more fevered than ever. The reason? Because it lives up completely to it reputation. Seriously one of most favorite beers in the world.